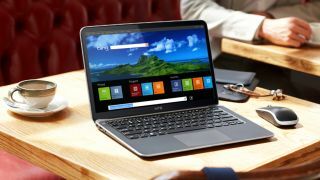 Thick-and-heavy laptops are becoming more of a niche product line (think portable workstations, gaming station and mobile servers) as the market share and the sheer amount of SKUs (Stock Keeping Units) of svelter and more attractive Ultrabooks and other thin and light notebooks swell. But these do come with a number of compromises - like a sore lack of connectors. We've put together a list of accessories that can not only dramatically augment the capabilities of an Ultrabook but also transform it into a veritable powerhouse. If you want to know what makes an Ultrabook, give the above a click. From a distance, it looks like a standard USB cable with a microUSB connector on one end and a bigger-than-average one on the other. But look closer and you will see that it is a mirroring and KM (keyboard and mouse) sharing accessory. Sold by Lindy for £40 ($67), the KMC6105 allows you to view and interact with your Android device regardless of the brand and platform (i.e. tablet, Chromecast, smartphone) as well as sharing your keyboard and mouse. Audio has historically never been a forte for laptops and that hasn't changed a lot for Ultrabooks especially for those at the lower end of the spectrum. Which is why something like an external sound card comes in quite handy. USB devices in general usually carry a performance penalty mostly because they use the host's processing power. They also have a small impact on the battery life. However, given how powerful the recent crop of Intel-based processors has been, that shouldn't be an issue. Startech sells an audio adaptor that plugs in a free USB port and essentially adds a 5.1 sound card. Startech's £18 ($30) external card comes at the end of a rather long USB cable, uses a C-Media CM108AH chipset and is capable of sampling audio at up to 96kHz. Available in black or white, it does support Sony's PlayStation 3 gaming console and comes with a two-year warranty. If you ever wanted to share a hard disk drive wirelessly, there are a number of proprietary solutions available, but few can do it as simply and as cheaply as this solution from Startech. This wireless 2.5i-n External SATA Hard Drive HDD Enclosure w/USB & WiFi AP costs £90 ($150) and is essentially an empty enclosure that can accommodate a 2.5-inch HDD. You can connect to it via a USB port or Ethernet (if wired) and wirelessly over Wi-Fi (802.11b/g/n) thanks to a Ralink RT3052 chipset. It can be used as a NAS (Network Attached Storage), a dumb storage device or as a wireless hotspot (to share internet access). It is unfortunate though that the device is only compatible with USB 2.0, which will affect data transfers adversely.